This is a 100 g bottle of green Ferric Ammonium Citrate from Photographer's Formulary. It is used in the production of cyanotypes. The bottle comes packaged inside a light-safe bag since the chemical is light sensitive. 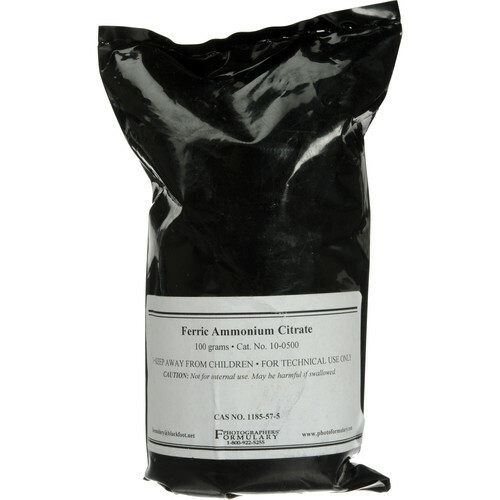 Box Dimensions (LxWxH) 3.8 x 3.1 x 2.2"
Ferric Ammonium Citrate (Green, 100 g) is rated 4.9 out of 5 by 15. Rated 5 out of 5 by Peter from Makes great cyanotype emulsion A bit of iron and a bit of ammonium. What's not to love? Makes other ferric ammonium citrate green with envy . . .oh . . . yeah, nevermind. Rated 5 out of 5 by Kristen the Printmaker from Cyanotype is easier than you think I bought this product as well as potassium ferricyanide to create cyanotype prints. I simply used instructions I found online and have made numerous prints. The product makes a lot more than you would think it would. I'm still working on my first batch of the solution with which I have made at least 50 8x10 inch prints. Rated 5 out of 5 by Michael from Your Inner Victorian Cyanotype prints are a wonderful, creative way for children and adults to discover darkroom magic. Using the formulas (check the web) with this chemical and potassium ferricyanide, you can sensitize ordinary paper and cotton cloth to become a beautiful contact printing media. This chemistry is being used for fine art printing of antique glass negatives, contact printing things like feathers and ferns, and as a demonstration material for photography education. Follow all warnings when using any chemical, though this one is pretty safe. Rated 5 out of 5 by Holly the Student from cyanotype chemicals I used this to make Cyanotypes with my class at a 4-H camp. They were a huge hit! Rated 5 out of 5 by cblaketurner from Does Exactly What it Says I make cyanotypes with this product. The amount is sufficient to last hundreds of moderately sized prints. The package came quickly, in a tightly sealed light-proof bag. If you want to make cyanotypes then use this stuff from photographers' formulary. Rated 5 out of 5 by Rivers Cuomo from Topshop, Great Stuff Cyanotyping like a madman. This is some good stuff, although disposal is tricky. gotta get that recipe right like mmmm; this stuff holds its own. the prints turn blue that shows this stuff is real and the real deal. Rated 5 out of 5 by orionankh from Wonderful product I use this chemical for making Cyanotypes, and it was sent in a black bag, which was great since this chemical in powder form is light sensitive. I have no complaints about this product. Why does it say green? Does it make green cyanotypes?